Despite that famous cryptic warning in the film 2010: The Year We Make Contact, NASA is planning for a possible attempted landing on Jupiters moon Europa. 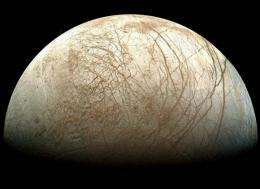 This is a mission that many people have been hoping for, since Europa is believed to have a liquid water ocean beneath the icy surface (as well as lakes within the surface crust itself), making it a prime location in the search for life elsewhere in the solar system. Two landers are being proposed which would launch in 2020 and land about six years later. While the landers wouldnt be able to access the ocean water which is well below the surface, they could analyze the surface composition with a mass spectrometer, seismometers and cameras. The mass spectrometer could detect organics on the surface if there are any. The landers probably wouldnt last too long though, because of the intense radiation from Jupiter on the unprotected surface (as Europa has only a very slight, tenuous atmosphere). Accessing any of the water from its ocean or lakes would require drilling deep down, something for a more advanced future mission. It might be noted that a return mission to Saturns moon Enceladus would also be possible, especially since the water from its subsurface ocean or sea (depending on the various working models of its interior and geology) can be sampled directly from its water vapour geysers, no need to drill down. The Cassini spacecraft has already done that more than once, and has found organics of various complexities, but Cassinis instruments cant detect life itself. Either destination would be exciting, as both are thought to be two of the most likely places in the solar system, besides Earth of course, to be inhabitable or even possibly inhabited. Everywhere on Earth where there is water, there is life. That may or may not be true for Europa or Enceladus, but well never know unless we look. $2 billion dollars ought to pay those inflated salaries for a few more decades, even as the government goes totally bankrupt and a puppet of the banks, which it really is already. "You're a mean one, Mr Grinch..."
Wow, comments are full of strange. Omatumr wears a tinfoil hat. Omatumr probably wears a human face. NASA's space exploration fraud is exposed. Spend $2 billion on a mission without any real chance of doing anything useful. You could make a THOUSAND ten-megawatt wind turbines for that much money, which would be enough to power 2.5 MILLION homes for free for 30 years. Instead, they choose to make more deficit spending on a useless tin can. @nanobraino; "You could make a THOUSAND ten-megawatt wind turbines for that much money, which would be enough to power 2.5 MILLION homes for free for 30 years." ... but only for about 30% of the time. "Instead, they choose to make more deficit spending on a useless tin can."... and you choose to deficit spend on useless fiberglass wings and things that will only last a small fraction of your 30 yrs. Do we really not have the technology to send something that can drill through the ice on Europa? Seems like a completely worthless mission. In 2026 we shall discover that there is no life on the surface and we will still be wondering if there is any under the ice. Wow, so much negativity! I'd be willing to pay $5/month in taxes for a couple years just to see high-res shots from Europa's surface. How cool would that be to see Jupiter from the surface of one of its moons?! I do agree though, can't we use nuclear power to melt through the ice? We have antarctica to test that sort of thing on! I have no desire to learn omatumr's theories on dealing with "delinquent teenagers". I'm assuming it involves pederasty. We are all sufferers from history, but the paranoid is a double sufferer, since he is afflicted not only by the real world, with the rest of us, but by his fantasies as well." As per the story, I thought that what was holding us back was the fact we'd need to figure out how to remotely drill over a mile through ice to get to the water... So if this is just for a surface mission I didn't think the surface is what we were interested in. I'm going to go out on a limb and try something new in these comments by actually commenting on the missions described in the article. I'm kinda biting my fingernails on which I would rather have. The Mars orbiter provides great information and pics. How do you thing they were able to find such good spots for the new pathfinder mission. On the other hand, I really like the close ups and spot science that an orbiter can't provide. I'm going to have to go with the orbiter first, then use that information to find the best drilling spot, and shelve the lander for now. Unless they can muster the political will to get it all in one mission - an orbiter with an attached lander/driller - with the flexibility to choose a landing spot upon arrival. it would be one very expensive mission, but it would be cheaper than a bunch of smaller missions. Europa is a must visit place , forget Mars .Whatever it cost in American tax dollars .I'm European and I totally approve of spending US tax $ on such a worthwhile project. We've had the technology now for 50 years ,since Apollo and according to Arther C Clark we're already two years late . What happened to that pioneering spirit ,the dreams of the visionaries ? There are places where the ice has cracked and water has sploshed up and subsequently frozen holding a record of what was/is in the water. Alternatively we/you could bail out the banksters for only 100 times the cost. I'm american, and I totally approve of spending Europe's money to fund these missions. We've ponied up so much for space missions in the past, it's time that the Europeans really start compensating us for allowing their 'astronauts' up into a station that they barely contributed to (1 module and a few supply missions) and taking them up to space on the shuttle throughout the decades. As opposed to the face that tevatron was the biggest accelerator for 20 years? Look, apparently you missed the sarcasm in my remark because it was not a big **** contest, or about asking europe to pay its fair share. I was pointing out that it's mildly rude the way you stated how you thought americans should spend their tax dollars. If you like the mission, then fine. We'll worry about what we will pay for or not - you are a little removed from america, and what our priorities should be. I'm disappointed in the prospects of this mission. Don't get me wrong, I would love to investigate Europa, but I'd like to do it right. In another article I read, they said they could provide more radiation protection for the landers, but they won't because of cost. So once again, cost is holding back scientific advancements. Costs which are relatively small compared to the one trillion dollars the US government spends every year on war and corporate welfare. Does it frustrate anybody else that we acknowledge potential scientific breakthroughs that could change humanity's perspectives on life as we know it, but we won't be able to do anything about it for decades because humanity would rather blow up missiles than build rockets? Imagine what could have been built with the anticipated cost of America's war crime in Afghanistan and Iraq? $4 trillion dollars. I wouldn't call it a war crime, but I know, I've done the math. You can replace all our energy infrastructure, AND make the wind farms triple redundant over thrice the area to address the "only makes power when the wind blows" issue. That is enough for 16 Terawatts worth of peak power, or 5.3 Terawatts worth of "1/3rd power". But the Coal Tards and the shadow government would never allow something like that, because it makes too much sense.